Finally Lilg and I are back again with the long awaited sequel to Griswold the Goblin. It's been a long journey for us, with many setbacks, sidetracks and almost a year of development. 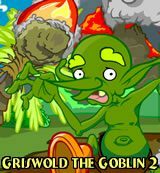 In this first chapter of this new on going saga called "Islands of Fire" you must help Griswold find the Goblin City. You will have to collect many items, solve puzzles, play several mini games and even navigate a labyrinth to help Griswold in this new epic adventure. Lot's of thanks must go to all the people who tested the game and to Tom Fulp for all the help he's given us!